Mac is an 8 year old attending regular classes and has Cerebral Palsy. He is quite the character and has a great sense of humor, and is using Morse Code to communicate! Mac learned Morse Code through an Excel spreadsheet his mother created. 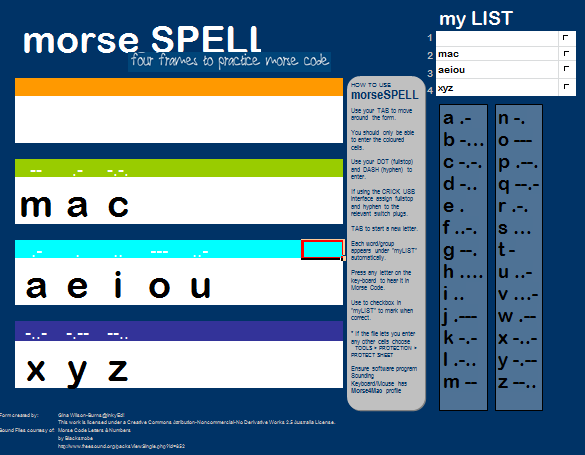 It is a very nifty tool for learning Morse Code. Here’s a video of him using two buttons to work with Morse Code, and here’s a link to Gina’s Excel spreadsheet she creating to help him learn Morse Code! This entry was posted in Morse Code Alphabet, Morse Code Facts, Morse Code on TV, Morse Code Video, Using Morse Code and tagged cerebral palsy, code, learn morse code, morse, morse code on 28 February 2012 by admin. Jericho Morse Code – What Does Jericho Say in Morse Code? Morse Code is used in the TV seried, “Jericho” in a variety of ways. In a few of the episodes, there is only one way to communicate – and that’s with Morse Code. The transmissions Jericho with Morse Code happen pretty quickly, and the Morse Code is being transmitted pretty slopily as well. This entry was posted in Morse Code on TV on 20 May 2011 by admin.